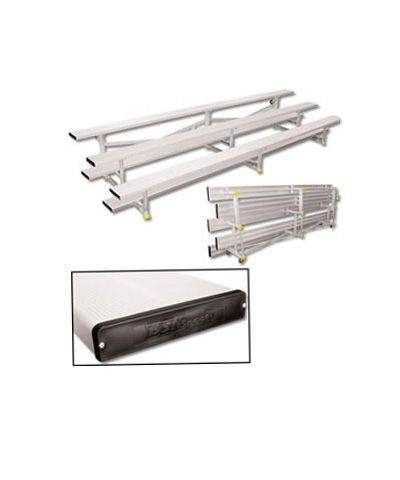 Light Weight Aluminum Tip N Roll Bleachers can be easily tilted sideways onto casters to move or store away. Frames are 100% welded, all aluminum angle construction. Equiped with heavy duty, non-marring, foot pads and swivel casters. 10" wide no-slip seat planks and foot planks. 3 row bleachers start at 16" high and rises 6" thereafter. 4 rows start at 17" and rise 8". Safety end caps on each seat and foot plank.